When I was in secondary school, around 2nd year, I started getting very dry patches of skin on my face. The worst, that still haunts me to this day, was under my left eye. It became very red, slightly swollen, extremely dry and it kept coming back for months. To the point that again teachers and other students were asking me what it was. God I hated school some times. But anyway. Since then I've been very conscious of the skin under my eye - terrified of it getting in anyway dry ever again. 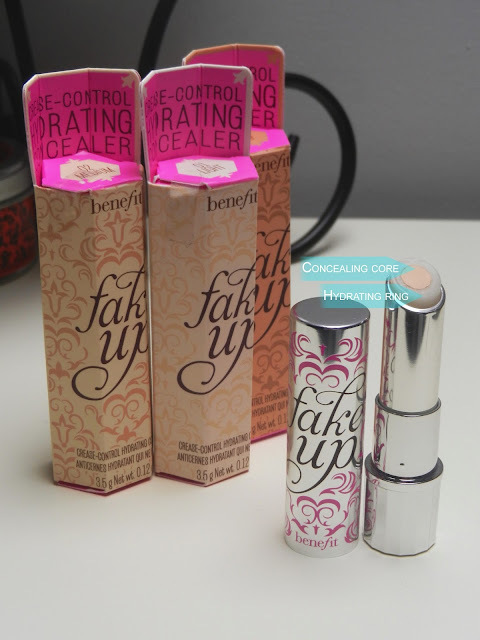 Fakeup is the new hydrating concealer from Benefit Cosmetics. And I know what you're thinking, since when is a concealer hydrating? Well this one is. It's exactly what my skin needs - usually takes any excuse to dry out and as much as I love Collection 2000 Lasting Perfection I think we can all agree it's very drying especially on already-dry skin. Fakeup has a hydrating ring of Vitamin E and apple seed extract and a concealing core, which a smooth, highly pigmented, soft concealer. Yes, it looks like a lipstick but some lipsticks look like concealers - so who are we to judge?! So not only are you concealing and covering up, but you're doing your skin some good - see, guilt free! Didn't know where I was going with that title, did ya?! It's lovely and sheer, but still wakes up and conceals the eye area nice and naturally. It also diffuses the light a little bit too - which is just what you want to help counteract dark circles and shadows. It comes in Light, Medium and Deep. 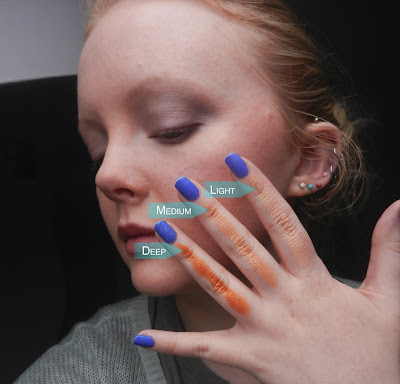 Benefit recommend you apply straight from the bullet in what's they're calling the Fakeup V under the eye and blend gently with your ring finger (always finger, your index or middle finger have too much force behind them which will pull at the delicate skin and do us no favours in the future). Also, because I've had quite a few fizzy drinks today and I'm feeling generous, you can also use Fakeup as a subtle highlighter on your nose, forehead - wherever. Or if you pick up the darkest shade you can use it for contouring. Fun, huh?! You can pick up Fakeup at your local Benefit counter for €26.50. What do you think of a hydrating concealer? What is your perfect under-eye product? Is it me or does the deep shade look very orange? This sounds great but heard because it's so hydrating it doesn't last very long?